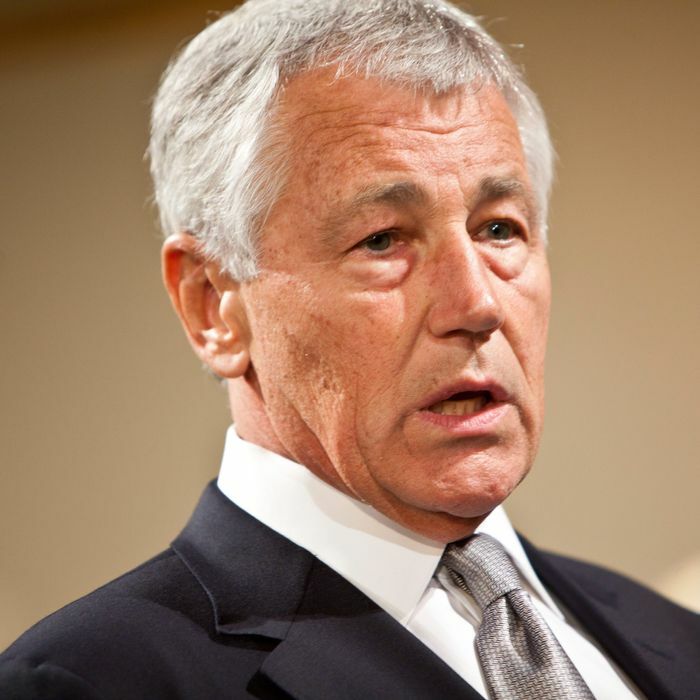 President Obama is expected to select former Nebraska Senator Chuck Hagel as the next Secretary of Defense as early as Monday or Tuesday of next week, according to Foreign Policy and confirmed by multiple reports. If you were under the impression that he had already been chosen based on the beating he’s taking in the press — for not loving Israel enough, for calling someone “aggressively gay,” for being the Republican he is and was — then just wait until after the weekend. Then the actual fun begins, although at least Hagel will have the White House really defending him. The official line today, according to NBC, is that “chatter” about Hagel as Obama’s final decision is “premature,” but the White House did admit he’s a “leading contender.” Other options to replace Leon Panetta after the sinking of Susan Rice included deputy Defense Secretary Ash Carter and Pentagon Under Secretary Michele Flournoy. That campaign has included anonymous Senate aides calling Hagel an anti-Semite, the Washington Post editorial board writing that “Chuck Hagel is not the right choice for defense secretary,” and the Emergency Committee for Israel, which counts among its board members Weekly Standard editor Bill Kristol, running a television ad criticizing Hagel’s opposition to unilateral sanctions against Iran. “For secretary of defense, Chuck Hagel is not a responsible option,” the ad claims. “The president has made crystal clear what his policies are on issues like Iran and Israel, and Senator Hagel will of course have a chance to discuss those issues in a confirmation hearing,” one source told the Daily Beast. As a Vietnam veteran and former member of the Reagan administration, Hagel also has a base of bipartisan support that will no doubt mobilize soon. On Morning Joe, David Axelrod previewed the defense we’re likely to hear a lot in the coming days and weeks. The early opposition to Hagel, he “speaks to the larger problem that we’re talking about, which is, we have to get the point, where, first of all, independence is admired and not discouraged, and we can disagree on some things and still work together on others,” he said. “And the notion that we demonize people because of a position that they’ve taken and disqualify them on that basis is what’s destroying the ability to get things done in this town.” There’s much more of that to come.